Came across that site a couple of years ago, wish it was around when i had a bash. If you know where to go you can buy the chemicals direct by the gallon, i cant give sorry. You would also be geared up for Nickel, copper plated, little extra required for gold plating, just a recirculation pump. The analogue Maplin PSU 0-30V 10A works well i bought for backup. The few areas i had trouble with were breakdown in electrical connection even driving wedges in. Alum wire was useless lost connection in secs. Notice his TI spring clip rack! Must have another go some time still got the small 4 gallon tank. You might like this site. I've just got all the stuff rounded up to try his method, but have not yet done so. I'm using small plastic coolers (the size that hold a 6 pack) as I don't plan to do very large parts --at least for now. And while I will come back and tell how it went, it may be some while --it's a real back burner project for now. But I have all the stuff rounded up, so when I do get around to it, I can just do it. 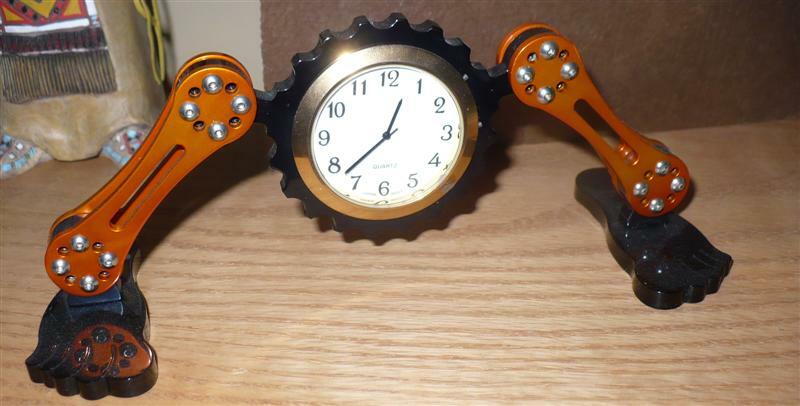 Always interested in the anodising but come on guys.... What about those clocks! !